Artist Wil Natzel is creating a pop-up art installation of incredible cardboard flowers near the Stone Arch Bridge in Minneapolis, MN using the humblest of materials — cardboard! 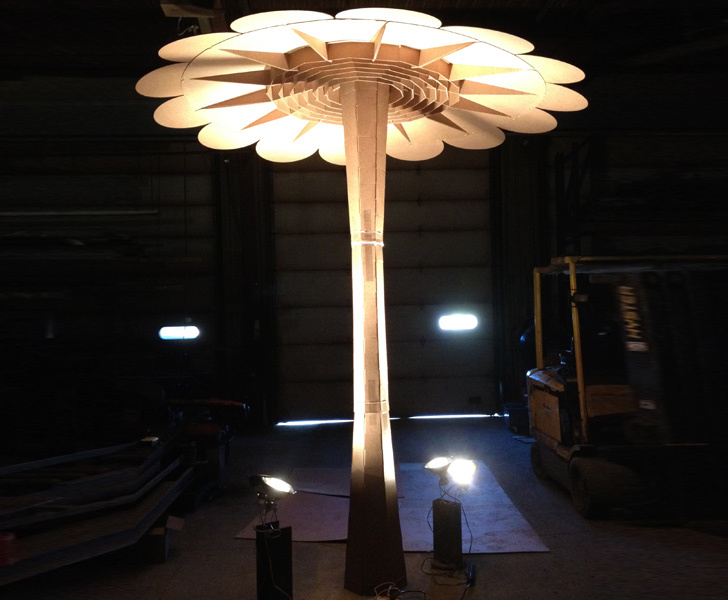 Using his own specialized CNC cardboard cutting knife, he will create eight “Night Blooms” that range in height from 15 to more than 20 feet, assembled into a cluster. Each bloom has a round ten-foot diameter top that forms a permeable enclosure, creating an environment that can be explored throughout the night as part of the Northern Spark 2012 art festival. Wil’s Night Blooms will be used to create a structure where pattern and decoration can thrive in architecture. He sees the project as a form of “spatial graffiti” – “a purely decorative enhancement to the built environment”. This project draws upon his interest in the history of architectural ornamentation, as well as its expression today using contemporary tools in unexpected ways with unusual materials. Northern Spark is a free, dusk to dawn, participatory arts festival that presents visual arts, performance, films, and interactive media indoors and outdoors in Minneapolis. In 2011, during the course of one night, 50,000 visitors experienced 100 projects by more than 200 artists at 34 venues in collaboration with 60 partner organizations and sponsors. This year’s event kicks off June 9-10 – don’t miss this chance to explore a constellation of urban arts and discover the city in a new light! Artist Wil Natzel is creating a pop-up art installation of incredible cardboard flowers near the Stone Arch Bridge in Minneapolis, MN using the humblest of materials — cardboard! 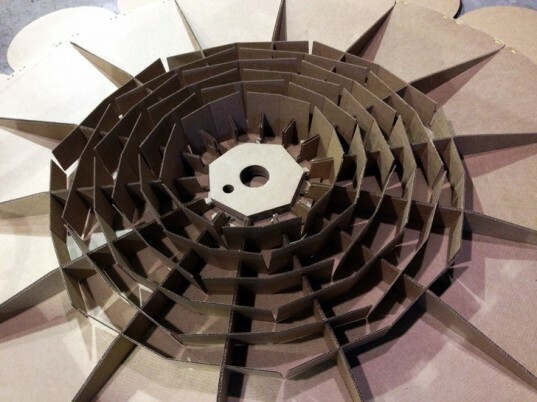 Using his own specialized CNC cardboard cutting knife, he will create eight "Night Blooms" that range in height from 15 to more than 20 feet, assembled into a cluster. Each bloom has a round ten-foot diameter top that forms a permeable enclosure, creating an environment that can be explored throughout the night as part of the Northern Spark 2012 art festival.